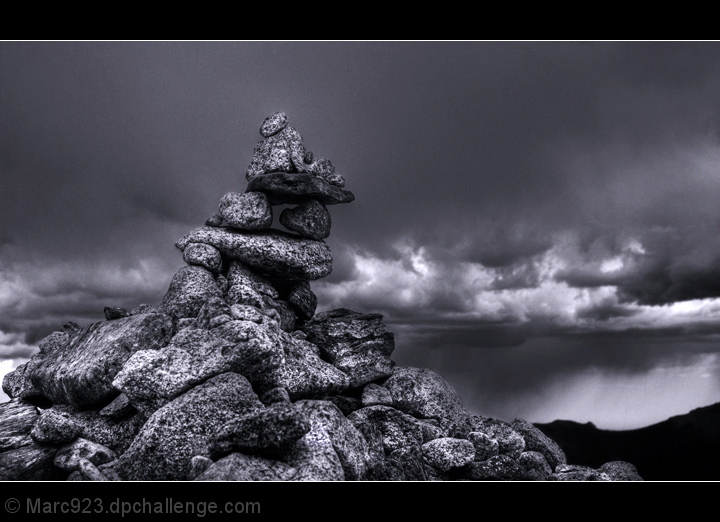 I call this A Zen Moment because as I was hiking down from Chasm Lake, I noticed this cairn. I stopped and stared at it. Even in the rain and thunder, I found a moment of peace. Just one of those moments where nothing else around you matters. So I dug the camera out of my pack and took this shot. neat..it looks like a stone person setting ontop off the rock pile, 10. Yes it is and it's a perfect one. This image conveys power and strength, yet it is subtle and gentle at the same time - a very zen like concept. Very nicely done with no major technical issues and a terrific artistic impact. One of the better images in this challenge. Proudly hosted by Sargasso Networks. Current Server Time: 04/24/2019 09:49:35 PM EDT.